Mayfair Aesthetics has chosen to work exclusively with the new Soprano ICE Platinum system, winner of ‘Most Innovative Treatment’ in the 2016 MyFaceMyBody awards and the first and only laser hair removal system featuring trio clustered diode technology, combining three laser wavelengths into a single applicator simultaneously treating different tissue depths and anatomical structures within the hair follicles. By combining the absorption and penetration levels of three different wavelengths, along with the treatment coverage, comfort and virtually pain-free treatment of the diode laser, Soprano ICE Platinum achieves the safest and most comprehensive hair removal treatment available today. Alex Technology: 755nm wavelength offers more powerful energy absorption making it ideal for the widest range of hair types and colours, especially lighter coloured and finer hair. Diode Technology: 810nm is the classic wavelength to offer deeper penetration of the hair follicle and high average power. YAG Technology: 1064nm wavelength offers the deepest penetration of the hair follicle making it a optimal solution for darker skin types and thicker, darker hair. A high repetition rate of short pulses are delivered deep into the dermis, achieving high average power and therapeutically effective heat build-up. The sweeping In-motion technique of moving the applicator repeatedly over the treatment area ensures full coverage while ICE technology cools the skin surface- preventing superficial burns and allowing for virtually painless yet highly effective hair removal. A full course of 6-8 treatments should result in a permanent reduction of hair growth; however this is dependent upon individual skin tone and hair. A good responder will expect to see a 60-90% reduction in hair growth. An annual top up session is recommended for maintenance. Please speak to our reception team for further information. 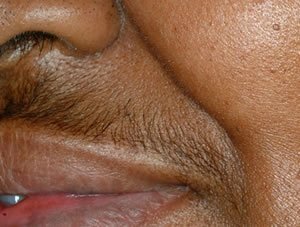 Apart from shaving, avoid any other hair removal method such as waxing, threading or hair removal creams for 6 weeks prior to treatment and throughout your course. Avoid sunbeds or any kind of fake tan for 2 weeks and normal sun exposure for 1 week prior to treatment. 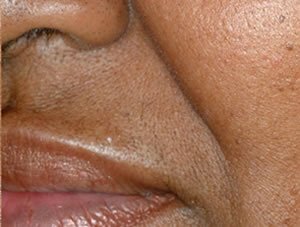 You should shave areas to be treated or patch tested around 8 hours before your visit. We will discuss any medications in detail at your consultation. After treatment you may experience mild redness or slight sensitivity. Aloe Vera gel is excellent to calm and soothe the skin and works well straight from the fridge. For any areas treated that are exposed to sunlight, you should protect your skin with a factor 30-50 SPF sunscreen. We stock Aloe Pura SPF 50 Aloe Vera sunscreen that will protect while cooling and soothing. After the laser treatment avoid heat such as hot baths or showers, saunas, and steam rooms. Avoid vigorous exercise and swimming as the chemicals in the water may cause irritation. Our team is always available to provide continuing advice and support even after your final session is complete. The Soprano Ice Platinum is suitable for any skin type including skin that is tanned (wait 1 week after sun exposure). Our system uses 3 different laser light wavelengths to target the widest possible range of hair colours and textures. As lasers target the melanin pigment within the hair follicle, ginger, white or grey hair will not be affected by the laser. The more melanin in the hair, the more effective the treatment tends to be. Very fine hair (vellus hair) may also not be the best candidate for laser hair removal because hair lacking sufficient density may not contain enough melanin for an effective result. We can only treat clients aged 18 or over. Clients taking Accutane or similar anti-acne medications or who have been taking Accutane during the past 6-12 months. Clients who are on regular daily antibiotics. Anyone who is pregnant or planning on becoming pregnant. Anyone who is sunburned, has peeling skin, has had significant sun exposure less than 1 week prior to treatment or has a fake tan. Anyone with a history of cold sores to the treatment area should start taking an anti-viral medication for 3 days before and after treatment. Clients with light sensitive epilepsy, vitiligo, type 1 diabetes, history of keloid scarring or lupus. Clients currently taking any medication or herbal supplement that may cause photo-sensitivity. It is advisable to seek a doctors note in this case before commencing treatment. Yes, at Mayfair Aesthetics laser hair removal is safe. There is an extremely low risk of complications when our experienced practitioners operate the laser for a given skin type following the correct treatment protocols. The Soprano Ice Platinum system is one of the safest on the market, as rather than delivering all the laser energy in shots such as with traditional laser systems, the applicator is passed back and forth over the area to be treated so that energy and warmth builds up over a few seconds. Soprano Ice Platinum emits 3 different laser light wavelengths simultaneously during each treatment. Each wavelength penetrates a different depth into the skin to damage different parts of the hair follicle, root and bulb resulting in drastically reduced hair growth. Other lasers, including standard Soprano Ice only emit 1 laser wavelength (and in some cases 2 wavelengths). This means that the Soprano Ice Platinum treatment is more effective in reducing and eliminating hair growth than other laser systems. As Soprano Ice Platinum is passed back and forth over the area to be treated several times so that energy and heat builds up gradually rather than using the old fashioned ‘shots’ method, this treatment is safer and virtually pain free when compared to other laser systems. Laser hair removal will only treat hair in the Anagen phase of growth, roughly 10-15% of the hair in any particular area will be at this phase at any time. Each treatment, 4-8 weeks apart will treat different hairs at this stage of their life cycle so you should see a roughly 10-15% reduction in hair per treatment. Most people will go for 6 to 8 treatments per area, possibly more for more resistant areas such as the face or private area. It is necessary to shave any area to be treated with laser to ensure the session is safe and effective. The optimal time to shave is around 8 hours before your appointment time. This allows your skin time to calm down and any redness to fade while still leaving a smooth surface for the laser to treat. If hair has not been shaved, the laser will mainly heat up the hair outside the skin rather than the root structures as required. This will not be comfortable, presents an increased risk of side effects and will also result in the treatment being ineffective or less effective. 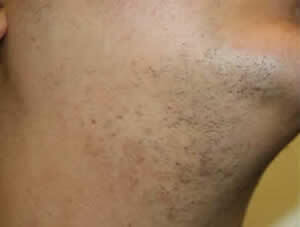 Anyone arriving for a laser treatment unshaven will not be able to receive a treatment. Mayfair Aesthetics offers men’s shaving for the back and shoulder area for the small charge of £10 per visit. Speak to our reception team to arrange a shaving appointment around 8 hours prior to your laser treatment. As well as the very latest, most effective and painless laser hair removal system available in the UK, at Mayfair Aesthetics, you are guaranteed first class service. You will always be treated by a highly trained, experienced laser specialist throughout your course of treatments with the treatments progress monitored on every visit. You can request the same therapist on each visit should you wish but we have invested greatly in training to ensure that all treatments will be carried out to the same high standard. As a boutique clinic, you will receive exceptional service from our highly trained team of experienced laser and skin specialists, easy bookings, complimentary refreshments and very competitive prices. Carrying out the treatment correctly will have as much influence over your treatment outcome as the Laser used. The individual care given by our expert team and ongoing training is an essential part in delivering outstanding treatment results. Leaving behind old fashioned paper and pencil consultation forms and client records, we have created bespoke Ipad forms that are securely stored to ensure that we never lose any of your treatment records. These records are accessible from any of our locations so you can be assured that whichever one of our clinics you visit, you will receive the same standard of service. Our prices when compared to our competitors are excellent. We operate from existing, high quality clinic spaces. As we do not have the expense of a shop fit for each of our locations, we can charge a more reasonable price than our competitors. For a price comparison with our main competitors please click here. At Mayfair Aesthetics, we offer highly effective, affordable laser hair removal. Yes. You must wait at least 7 days after sun exposure before having a laser hair removal treatment and you should wait at least 7 days after treatment before having any sun exposure. Avoid sunbeds throughout a course of laser hair removal. If your skin is still red from sun exposure or you have been sun burned or are peeling, you will need to wait until the skin is completely healed before commencing treatment. For more information click here.